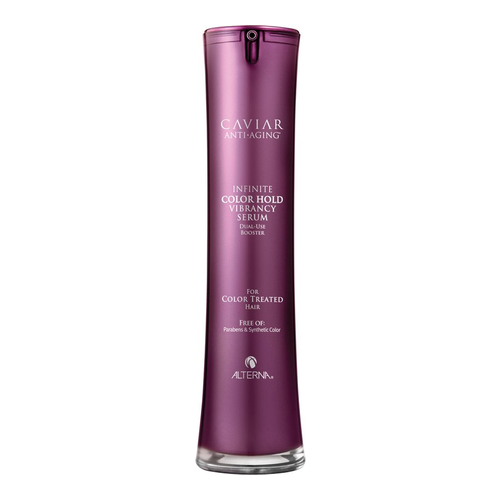 A revolutionary, dual-boosting hair serum that rejuvenates color and intensifies shine. Use as a leave-in treatment to replenish moisture and boost radiance, or mix with any Alterna conditioner to transform it into a color recharging masque. Proven to reduce hair breakage by 92% and provide heat protection up to 450°F (232°C). • As a leave-in, apply 2-4 pumps to clean damp hair. Style as usual. • To transform your conditioner into a color recharging mask mix 6-8 pumps with any Alterna conditioner. • Apply on wet hair and let sit for 3 minutes. Rinse.